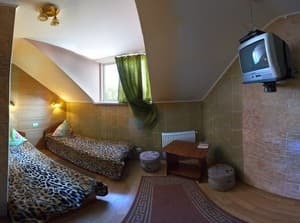 Hotel "Palada" is located on the outskirts of Lviv in the direction of Ivano-Frankivsk. The hotel complex consists of 2 buildings, a summer area and a car service (evacuator services are provided). The 1st building is a 3-storey building in which on the 1st floor there is a car-care center, car wash, tire fitting. On the 2nd floor there is a banquet hall for 40 seats and a grill cafe. The restaurant serves Ukrainian and European cuisine. 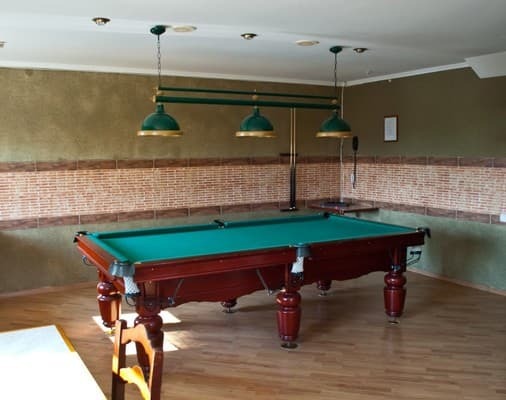 On the 3rd floor there are hotel rooms and a games room with table tennis and billiards. 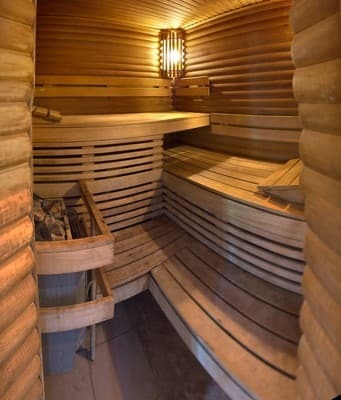 Also in the hotel there is a sauna, which is designed for 6-8 people. The second building of the hotel "Pallada" is a new building, which has 5 floors (there is an elevator). On the ground floor there is a restaurant for 120 people. The ground floor is occupied by a wood-heated sauna with warm pools and bowls for immersion in cold water, as well as a separate relaxation room. On the 2nd-5th floors there are hotel rooms for 80 people. 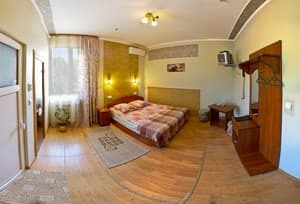 The cozy and comfortable rooms are equipped with TV, refrigerator, air conditioning and private bathroom. Total hotel complex "Pallada" has 48 rooms of various categories, where you can simultaneously accommodate 120 people. The hotel has a 24-hour reception. Free parking, free Wi-Fi in public areas. The distance from the Palada Hotel is 12 km from the railway station, 11.3 km from the bus station, 13 km from the airport. 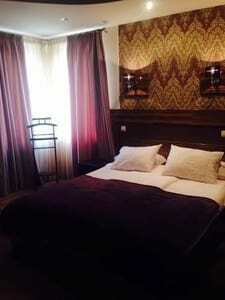 Description of the room: Area of ​​the room is 27 sq.m., consists of a room and a bedroom. Sleeping places are provided in the form of a double bed and a sofa. Description of the room: The area of ​​the room is ~ 24 sq.m., consists of an entrance hall and a room. Description of the room: The room area is 19 sq.m., the room consists of an entrance hall and a room. The room has two twin beds. Description of the room: The room area is 27 m2, consists of a kitchen and a room. 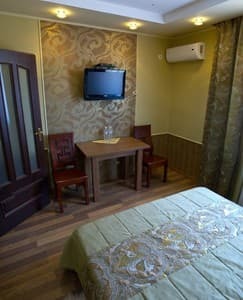 The room has everything you need for a comfortable stay: a double bed (180 * 200), a wardrobe, bedside tables, table, chairs, plasma TV with satellite and terrestrial channels, an internal phone, Wi-Fi Internet, air conditioning, refrigerator, chest of drawers . In the bathroom there is a bath and a shower, a wash basin, a toilet, a heated towel rail, floor heating, a hairdryer, bathroom accessories. Description of the room: The room area is 24m2, consists of an entrance hall and a room. Room is equipped with three separate beds. Грязно,до номера не провели ,в номере пыль ,паутина и тд. неплохая гостиница, для краткосрочных пребываний есть все необходимое. в моем экономе была сауна но душевая совмещена до крайности. То есть до полного отсутствия поддона :) для меня не критично, а кому-то может и не понравиться. после приёма душа к унитазу не подобраться, а тапочек в номере нет. Кухня на якій готовится їжа СССР, столи,обладнання не оновлені (думаю Фреймут поставила би "2"). Для сніданку потрібно переходити метрів 150 в іншу будівлю. Приятно порадовала быстрота работы персонала отеля при поселении в номера.Комнаты чистые, уютные, прибывание в отеле оставили положительные эмоции. Отель находится далеко от центра города. Убранство номера, хорошее дизйнерское решение, отзывчивая администратор на входе, хороие цены на "холодильник", еду в ресторане. В ресторане не предложили меню, спрашили на уровне "а что у вас есть". Музыка в кафе. Далековато от центра, но знали на что шли. Children under 6 years old stay free of charge. Additional places on request (fee service). On the 2nd floor there is a banquet hall for 40 seats and a grill cafe. The restaurant serves Ukrainian and European cuisine. Breakfast can be ordered for an extra charge. 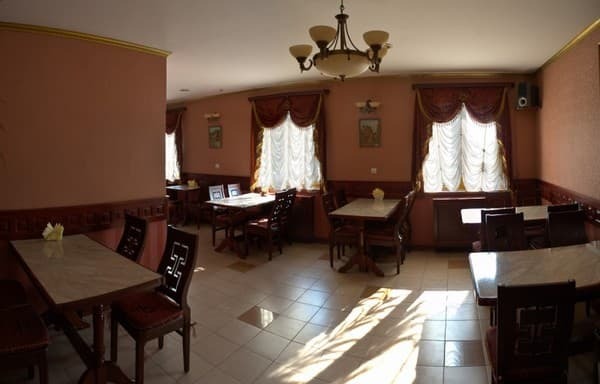 Hotel "Palada" is located on the outskirts of Lviv in the direction of Ivano-Frankivsk. The distance from the Palada Hotel is 12 km from the railway station, 11.3 km from the bus station, 13 km from the airport.